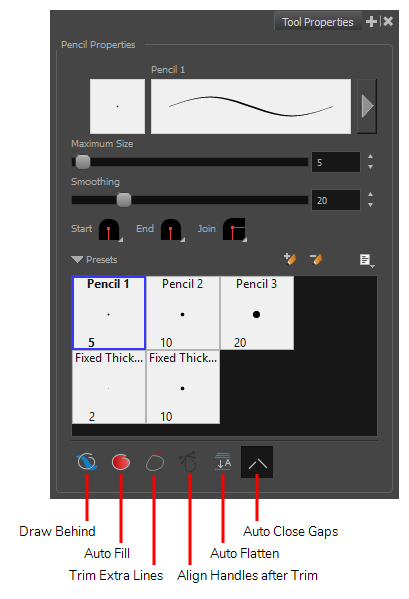 The Pencil tool allows you to draw simple contour lines that are defined by their centerline and their thickness. When enabled, your drawing strokes will be added underneath the existing artwork instead of over it. NOTE Your stroke will appear over your artwork as you draw it, until you release the mouse cursor or tablet pen. If you want a live preview of your stroke, activate the Realistic Preview option by selecting View > Realistic Preview from the top menu. When enabled, if you draw a closed shape, it will automatically be filled with the selected colour. When enabled, if you draw a closed shape, the lines extending from the point where your stroke intersects with itself will be automatically trimmed off. If the Trim Extra Lines Mode is enabled, enable this to automatically smoothen the corner at which your stroke intersects with itself. By default each pencil line you draw is a separate drawing object which can be manipulated individually. With the Auto-Flatten mode enabled, overlapping pencil lines will be merged together into single drawing objects. Pencil lines will be broken where they intersect, allowing you to select any segment of your artwork as if it was a separate stroke.